Well heeled gents might slip into these Dress Boots to pay any number of professional or social calls in town. A decidedly spiffed up and sophisticated alternative to everyday work boots. Crafted with a polished kid leather upper, our ankle height boot features a comfortable round toe and with detailed stitching and accent perforations. For a secure fit, our men’s dress boot laces up with a combination of both eyelets and hooks while the padded tongue and collar offer all day comfort. Dress midsole, flat traction leather outsole and 1 inch capped dress heel. Imported. Available in men’s sizes 7 - 13. Dress up your boots with a pair of our spats here. These are great! I was initially hesitant after reading some the reviews about these boots - but decided to pull the trigger anyways and purchase them. I was VERY pleasantly surprised when I received them and discovered that they were not the costume boots I was half expecting them to be - but really nice name brand boots that I had actually been looking at at a department store just the other week. Yes the sole is slick - but that will pass with wear - and there IS a slight creaking - but after looking online at more reviews I read a very easy fix for that and it will help prolong the life of the boot. All in all - very satisfied! We will be sending the boots back as they look like they are made out of plastic and we cannot give them as a gift as planned. Really nice; service very good. I wish you had sizes wider for old folks feet. I have loved every purchase I've made from Historical Emporium. I own a gorgeous overcoat, a vest or two and a pile of shoes -- the latter being the main thing that drew me to the site and has kept me coming back. Unfortunately, these particular boots have not delighted me the way my previous three shoe purchases have done, and for just one simple reason: CREAKING! These are the creakiest shoes I've ever owned, to the point where I don't dare wear them to work in my VERY quiet open-bay office. You can hear the creaking from halfway across the cube maze. I need to look into a way to reduce the creaking noise -- I know simply wearing them will help, breaking them in, but is there anything Historical Emporium can recommend to help speed up the process? A kind of oil or wax to rub in and improve the give? Don't get me wrong -- they're gorgeous boots. But this issue really has been disappointing, and next time I'll stick to buying more of the kind I purchased previously, which don't have this problem. Thanks -- I am still a big fan! These are the most comfortable dress shoes I have ever bought! And they are fabulous! I just didn't listwn to the rwview about it being a size large when I should have. Great shoe so far no complaints. Super snazzy! The shoelace is a little shorter than I'm used to, and, as was mentioned in other reviews, the slick leather outsole will require relearning to walk. I bought a size smaller than I do for my modern shoes and it fits great, and looks great. I searched and searched online for a dress boot to wear at my wedding this summer, until I found this shoe. The pictures on the website made it look like everything I had looked for. I ordered the boot and eagerly awaited its arrival. I was so disappointed, however, when they came that I immediately returned them. The pictures on the website are not at all true to the color, texture, and quality of the product's leather. If you want a better idea of what the boot looks like, check it out on the Stacy Adam's website. Even their pictures aren't perfectly accurate. This shoe could not be worn for anything other than a costume. The leather upper looks and feels like plastic; the shoe laces are also of a poor quality. I would not recommend this boot to anyone who is looking for real footwear. A fashionable gentleman could not do better. I wear a size 12 or 13 shoe, normally the latter, and I went with a 12 in this case and they fit well, maybe even a little large. I would recommend them to anyone. These boots compare VERY favorably to an authentic similar pair I own. The leather is somewhat thicker, and therefore somewhat stiffer, but that is not necessarily a bad thing. I am considering getting the same in black so I can save the originals. though a nice pair of boots they did need some breaking in. the soles were slippery and i slid around carpeted surfaces for a few days so wear those boots in early. also its been a few weeks and I've already lost 3 of the upper lacing pins. i may have been lacing my boots too tight but that's the way i like them. other than that i love theses boots there aesthetically pleasing with a simple design and an air of sophistication. These boots are made of quality material and are constructed very well. I wear them as an entertainer for hours on end with no foot pain. They are holding up very well, and when the time comes, I will definitely reorder these boots. I would highly recommend them to everyone. My now husband purchased these shoes after months of looking for the right style. We did a steampunk/victorian based wedding. We purchased all his clothes for the wedding from this site after months of looking elsewhere we returned to complete the outfit. They where just the last piece to match some wonderful clothes. We did an out door/indoor wedding. They stood up well to the dirt, dancing, and sword play at our wedding. We then took them on our hoonymoon and they filled in for modern dress shoes.The shoes did squeak throughout the wedding and week long cruise, so do take some time to break them in before any important events. They are stiff, but that like the squeking we preseve with go away with a proper break in period.We will return again to buy more outfits for future events from this site. 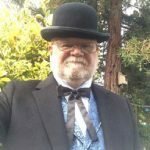 My husband looks horid in a modern suit but dashing in the victorian wear.